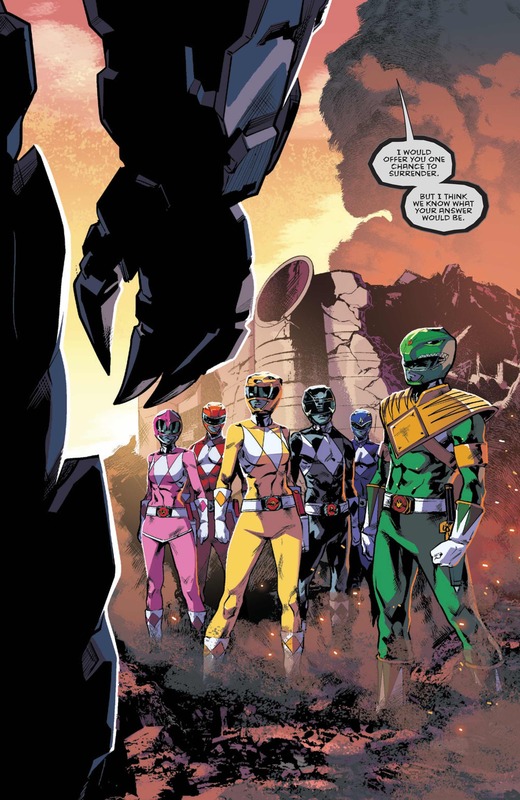 Mighty Morphin Power Rangers #6 Review – AiPT! The team is on to the Green Ranger and his visions, but does that even matter when a new threat comes to tear their powers right off of them? Issue #6 of Mighty Morphin Power Rangers is here, is it good? Kyle Higgins has been writing a strong series so far; one that’s aged up slightly for an older audience, but still retains the charm of the original show for the little ones. The art has been bringing that age level up with a darker tone and a more serious feel as well. Plus, we just came off the fantastic annual issue! Higgins and artist Hendry Prasetya do not disappoint when it comes to the new threat in this issue. It has a shark like head, does terrible damage to the Power Rangers and doesn’t even have to become giant to hurt them; somehow this thing can peel the suits right off the Rangers and it can do so with ease. The process is also incredibly painful for them, which makes this issue feel very dire indeed. I’ve never seen the Power Rangers pushed this hard and they have seemingly no answers, which makes matters even more engrossing. Prasetya does a fantastic job on art. The Power Rangers look ripped, realistic, and very much like superheroes. The effect Prasetya uses to show the suits peeling off is pretty cool too, as if the color is being washed away to reveal their bodies. The art humanizes the characters, which helps make the pain they go through all the more difficult to watch. As always, the backup is written as if it’s for little kids. The humor is slapstick, but I don’t even think little kids could enjoy it. It’s too silly and in this issue’s backup it doesn’t do much beyond spill paint on Bulk and Skull. Nothing much happens really. Speaking of nothing happening, the main issue doesn’t do a lot either. The Power Rangers get attacked sure, but aside from that and the fallout we’re left with a cliffhanger that could have occurred on page two. Some special significance is give to one of the Power Rangers, but aside from that not a lot happens. One could argue a major thing happens to Zordon and Alpha, but we don’t actually see it happen, nor do we know if they’re really hurt, dead, or what. This is an okay issue that reminds us the Power Rangers can be taken just as seriously as any superhero. Aside from the great art however, nothing much happens and the backup doesn’t help matters either.